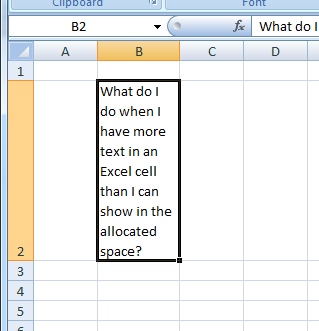 What do I do when I have more text in an Excel cell than I want to show in the allocated space? Something making it "scrollable" would be preferred. My first thought would be to place a texbox in the cell, set MultiLine=True, WordWrap=True, EnterKeyBehavior=True, ScrollBars=fmScrollBarsVertical. 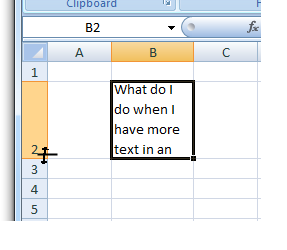 Size the textbox to the same dimensions as the cell. 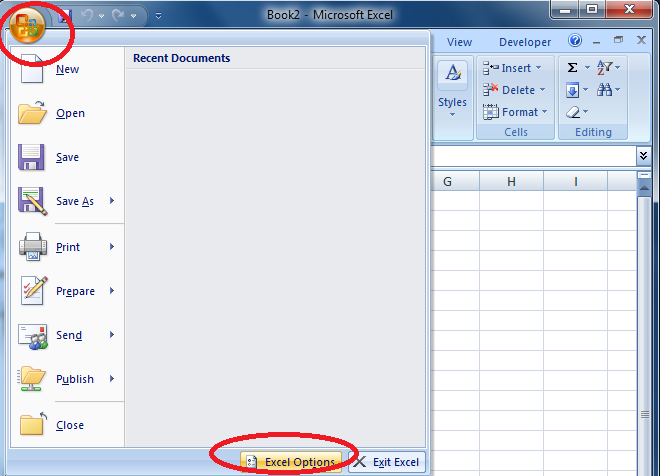 Turn on Developer Options: Click the Microsoft Office Button at the top left, and click "Excel Options" (next to Exit Excel). Enable "Show Developer Tab in the Ribbon" and click okay. Click the Developer Tab. 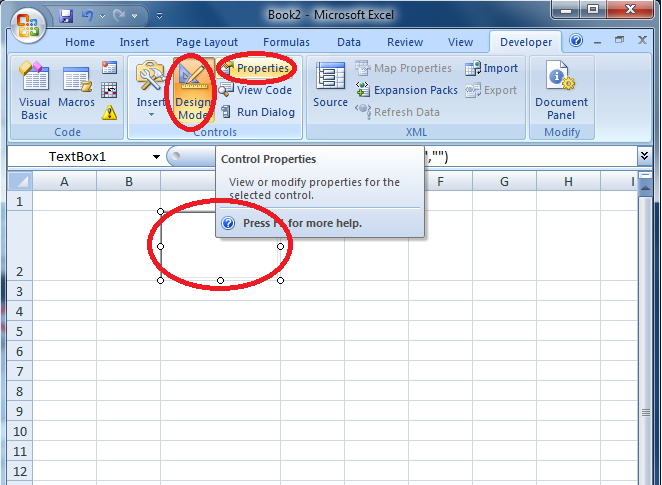 Under the Controls section, click Insert, and under the Active-X section, choose the Text Box (it looks like ab|). 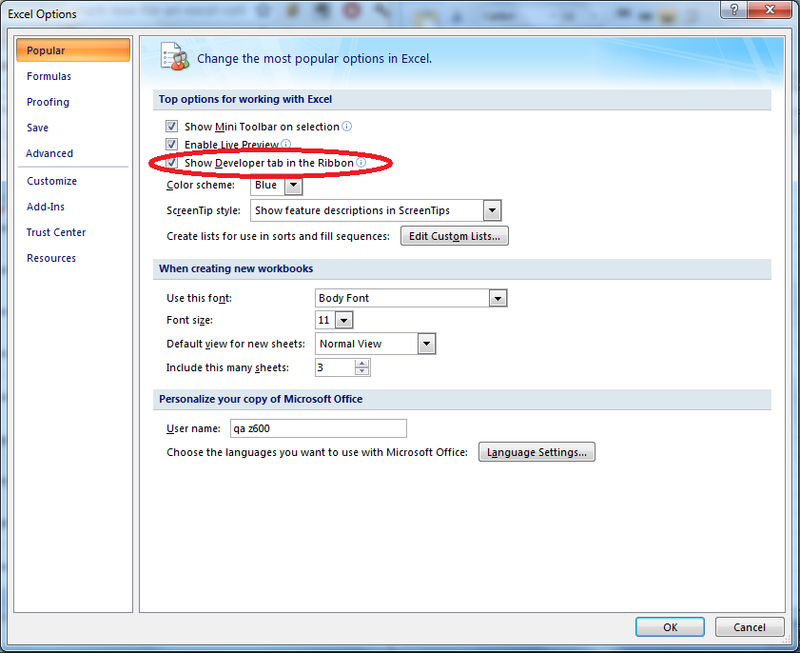 On the main worksheet, click-drag the area where you want to place the text box. Ensure Design Mode is enabled and click Properties. Set EnterKeyBehavior, MultiLine, and WordWrap to True. Set ScrollBars to 2 - fmScrollBarsVertical. Disable Design Mode, and enter your text. An Excel cell doesn't have scroll attributes itself (Without adding an external object container via OLE, ActiveX, etc). If its a relatively small amount of text, you can use the auto-resize option to get either the row or column to expand to display the full contents of the largest value in that row or column. To use it, slowly mouse over either the row or column headers (the A B C... or 1 2 3...). When the cursor is within a few pixels of the caption border, it changes from an arrow pointer to a "resize" line. While the cursor is in the state, double-click once to autosize that row (or column). 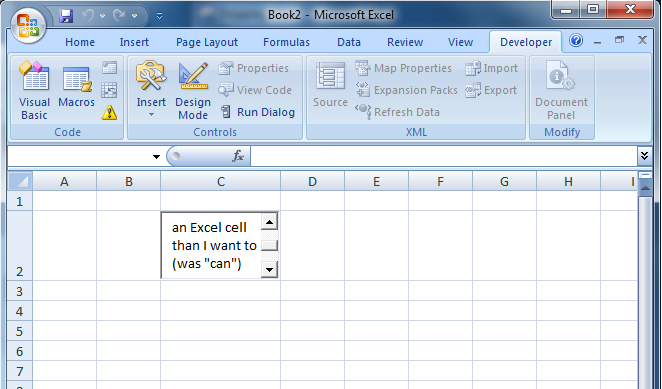 Without adding anything to your sheet, the contents of the cell are already scrollable in the formula bar. 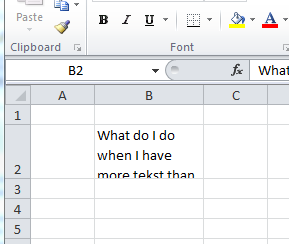 Just select the cell, and scroll the text in the formula bar. OR you can use wrap text the cell/column if you want to preserve cell width. Not the answer you're looking for? Browse other questions tagged microsoft-excel microsoft-excel-2003 spreadsheet or ask your own question. 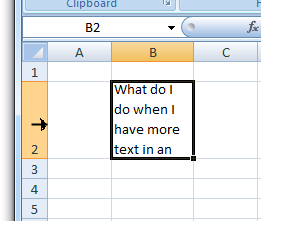 Excel cells - show text different to the actual value? How to Force 0 show in excel cell for ROUNDDOWN? Can a single cell in Excel extend over several pages? How?